18 hole, 72 par links - style course. 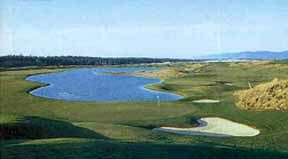 Designed by Rees Jones and awarded "Best New Public Course", 1993, Golf Digest Magazine. Driving range, Wee Links putting course, snack bar, lessons and golf packages. Enjoy fine food at Tavolo Restaurant.